Clint Willis’ book tells the story of Chris Bonington and his fellow mountaineers and their numerous attempts to climb to the summit of Mount Everest. I’m not a climber and I’ve never been near Mount Everest, though from what friends tell me about Everest Base Camp I wonder if one day I might manage to struggle up there to see it for myself. But I enjoy books about mountaineering because I am fascinated by what makes people want to put themselves at so much risk and put themselves through so much pain to climb a mountain. In Willis’ book, there’s little questioning of why Bonington et al risk everything on the mountain – there is a simple, unspoken acceptance of that risk from the beginning of the narrative, and in a sense that frees Willis to concentrate on trying to convey what moments of euphoria and epiphany it is that Bonington and his fellow climbers find on the mountain. In this way Willis neatly sidesteps rehearsing the arguments about whether or not we should feel sympathy for people who take such apparently insane risks, and instead focuses on what it is that makes people go back to the mountains again and again. If this sounds a little starry-eyed, it’s not. I think the great accomplishment of Willis’ book is that he manages to write about the interiority of the climbers feelings and fears – much of the time from a real-time “you-are-there” perspective which is obviously fictionalised to an extent – without collapsing into trite platitudes. I have to say that when I began The Boys Of Everest – and it’s not a small book, coming in at 400+ pages – I thought I would read a few chapters and have had enough. After all, I knew the story in advance: Men go up mountain, nearly die, come back down again, return the year later and do it all over again. After reading about the first mountain assault, how much more could be gained by reading about the next one? But there is something about Willis’ narrative that traces the arc of the climbers’ lives that makes their continual return to the mountains fascinating – and the loss of many of their lives truly tragic. Indeed, it seems that nearly all of Bonington’s Boys’ climbing victories were marred by the death of one of their number, whether porters, support staff or climbers themselves – and that Bonington’s own survival to become one of the oldest men to reach the peak of Everest was as much to do with sheer luck as his undoubted great climbing talent. It’s this nexus between human skill and the terrible indifference of nature that, to my mind, is what really comes out of The Boys Of Everest. Just like Jon Krakauer’s gripping memoir-as-exorcism Into Thin Air, about the 1996 Everest disaster that saw 8 people lost on the mountain in one day including two climb leaders, The Boys Of Everest makes it plain that no amount of skill, prayer, ingenuity and endurance can overcome Everest if conditions turn against you. Where perhaps the two books differ fundamentally is that the climbers in Krakauer’s ill-fated expedition were arguably not mentally or physically well-equipped enough to attempt to summit Everest; while Bonington’s crew were all fully aware that they were pitting themselves against a mountain that could take them however well they climbed and had indeed witnessed the death of friends already on its slopes or other mountains in the Kathmandu range. The knowledge of death being a slip away and the dreadful privations each climber routinely put himself through was and is simultaneously self -destructive and yet life-affirming, being at the very limit of existence and still being alive. 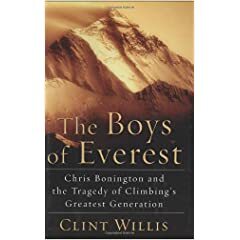 But while Willis does a masterful job of articulating the fears, elation and tragedy of Bonington’s boys over their decades of climbing, it becomes apparent that no amount of words can provide a definitive reason or formula for what drove these men to risk what they did. There is still something that eludes words, and Willis’ writing, like Jon Krakauker‘s, Joe Simpson‘s and Reinhold Messner‘s books before his, can only point to it.